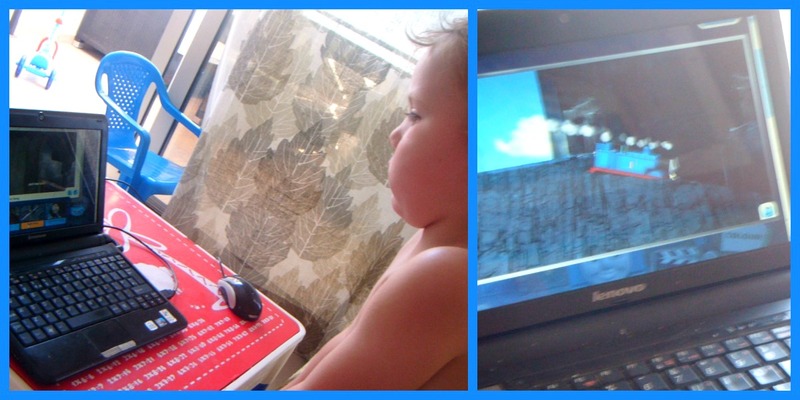 Some time ago I decided to show him the Thomas and Friends website, and it turns out he's just like his Mother when you stick a laptop in front of him, I think if left to decide when to turn it off he would be there for weeks on end! For a while now we've looked at it occasionally to see the engines, which is about as much as I let him do with my reluctance to let him use the laptop. He can now name every engine on there and there are more than 60, I'm not sure but I think he can read the names to a certain degree (either that or he has memorised the order of them) as he says the next one before it even appears on the screen. This week I showed him how to use the mouse as he had noticed the games on the site and I felt a bit mean not letting him have a go! In just a few days he has completely mastered it and is so funny to watch, we looked at the new section 'Blue Mountain Mystery' and his eyes grew wide with wonder (now I sound like Ringo Starr!) when he saw the new engines. This is not a sponsored post in anyway- although how cool would that be!